Rumors had persisted for months in the publishing world in Paris, a persistent whisper that Madame’s memoirs would be published, that this or that publisher already had a copy of the manuscript and was preparing it in secrecy in time for her centennial birthday, and what those memoirs contained was anyone’s guess. It became a favorite dinner party game of the literati in Paris to conjure up stories of her fabled past, to wonder what she would say of this or that lover who would after go on to his fame and fortune in the arts. Would she be specific, give details, tell the stories no one knew and everyone wanted to hear? He wasn’t old enough to care. All he could do on that chilly October day of rain and wind was to hurry toward the Rue des Grands Augustins and curse the fate that made his editor choose him to interview her, the only interview she had ever granted. He knew of her. How could he not? Nothing in all of the arts of twentieth century Paris had occurred without her name in the mix somewhere, usually in an undertone that implied something slightly salacious and scandalous. A courtesan some said dismissively, a muse, a woman who had inspired painters and writers, playwrights and musicians and composers, a mistress of this or that household name. Always as the inspiration, never as a creator in her own right. So she had done everyone. Who cared? Men were so grateful, that couldn’t have been too hard. Ah, there it was, the building with the Mariage Frères teashop on the corner, just as her housekeeper had said. His first surprise was her housekeeper, a tiny Somali woman who eyed him and his leather jacket with a suspicious eye and an indifferent shrug. “You have come to speak with Madame,” she said. “She is expecting you. You are late.” Another look that took him in from top to toe, his wind-blown hair, the raindrops on his jacket that dripped on the carpet in the foyer. He knew Madame had lived for nearly a hundred years, so he expected an overcluttered, over-furnished space full of porcelain figurines and lace doilies, all the detritus of a very long life very well-collected. There were none. Instead, the foyer was painted in a luscious sienna tone, the furniture dark, polished woods that gleamed in the gray light of a Paris afternoon reflected in a Moroccan mirror on the wall, a bouquet of Casablanca lilies perfuming the room. There must have been over a hundred photos in all sizes, hung in symmetrical patterns on the walls, a large glamorous portrait of Madame as she must have looked in her heydey, a face to rival Garbo’s, yet there was no tragedy in these eyes, only a steely glint of intelligence. And something else. He peered closer. This young face had, so his mother would have said, the Devil in her eyes, a thousand laughs hiding in one dimple in her cheek. Over there on his left, another photo, this one a long-gone day at the beach, laughing at the camera with a little boy wrapped in a towel, above it and all around it, impromptu snapshots of sun-drenched lunches, there was Picasso and Dora Maar, Hemingway smoking a cigar, Jean Cocteau with a bottle of wine and an impish grin on his face, goodness, was that Henry Miller, with that ecstatic grin that implied this was another free lunch? The library, the housekeeper had said, but this was like no library he had ever seen. As he crossed the threshold, he was assaulted – there could be no other word – by a perfume at once midnight-black and blinding white, and the room, goodness, the room. Overflowing bookcases from floor to ceiling and books stacked up on side tables, paintings, ornate Balinese shadow puppets and Dahomey masks, a lacquered Chinese screen and Japanese woodcut prints, a terrifying, lifelike wooden statue of Kali, jade sculptures and paintings by Braque, Picasso and Dali, a small white marble sculpture on the simple wooden desk that could only have been Brancusi in its exquisite purity of line, a leather sofa stuffed with silk brocade and velvet pillows and throws in every hue from scarlet to persimmon, Persian carpets piled three deep over each other and by the window, an armchair turned to the light beside a small table set with tea things and a cake plate on plain, white china. “I am sorry, Madame,” he stammered as he moved across the room and those plush, thick rugs, “The rain…” A chair. Sit. Yes. He turned slightly in his seat to look, and there was Madame. That disturbing perfume surrounded her like a veil and sent his senses reeling. He wasn’t used to women this old with this degree of notoriety, so he had not known what to expect, but this woman, wrapped in a paisley-embroidered shawl, was not what he expected. She looked simultaneously as ancient as some of her own books in their dilapidated leather covers and as young as he himself. She could have been a Sibyl in a Cumae temple, and she could have been an acolyte of nineteen. These were the eyes of a woman for whom life no longer held any secrets, yet life still made her laugh. That spark of mischief he had seen in that old portrait shot was still very much alive. “Well, Madame,” he stammered, “all of Paris is talking…” All his carefully thought-out questions slid out of his mind and scattered on the rug beneath his feet. “All of Paris…all that Paris always does is talk and gossip. That will never change! What stories will I tell, what yarns will I spin of when Paris was another city and life was so very different? Who did I love, who did I disgrace, whose fortunes did I steal and whose lives have I ruined? You want to know?” She leaned forward, and again, he was caught helpless in that heady, haunting, spicy cloud of incense and leather, blinding black and dazzling white. He was far too discombobulated to disobey. The tea was Lapsang Souchong, not his favorite kind. “Of course!” The answer was out of his mouth before he could think. “Then why is it you have never married any of your lovers?” He added a lump of sugar and stirred his tea. “Simple. Life is too short and too interesting to live from a cage. And I like my solitude, the order I created, the routines I have lived by. I have had…an interesting life. I have seen the wonders of the world, I have breathed the air of faraway places, and I have certainly not been bored. In a cage, I would have been bored to tears.” She shrugged, a very Parisian shrug of her shoulders that belied her age. “And many lovers.” He buried his burning face in his tea cup. It was her perfume, that haunting, heady scent of spice and power, fire and earth, light and dark that made him so bold. It had to be. It was like nothing he knew, like no one else. So rich and heady, so unapologetic and bold, so powerful, it was all he could do to even think. As she spoke, her face became softer, younger, it seemed to lose the years writ over her skin and he could see, or thought he could, the allure she once had held, the allure she had never lost, even now. For a moment, she seemed lost in a memory of a different time and space. Then she looked him right in the eyes, and again, he was struck by that blend of ancient wisdom and youthful laughter. They were separated by nearly three quarters of a century, yet behind those all-seeing eyes laughed a girl his own age. For a long and breathless moment, as the rain slid down the windowpanes, he could not even hear her breathe. All he could breathe in the quiet room, the low hum of Paris just outside her windows, was that perfume he knew now he would never, ever forget. Darkness and light, shadow and spice, flower and earth, it was both a remembrance and a visitation, a haunting and a redemption, power and passion, a passion that knew no time but its own. “You never answered my questions!” he remembered to say. “You never thought to ask!” she snapped. “ I answered all the questions you never dared to ask, the ones you really wanted answered. Now go. Anab!” She called again. As he turned down the hall toward the foyer, he caught a last glimpse of her, a frail figure wrapped against the October chill in her paisley shawl, looking out the window at a past that only she could see, or was that a future only she could know? “I just received a call. Madame died. It must have been right after you left. And strangely enough…He unwrapped the parcel. “I just received this…” he tore open the paper. It was a book, a thick hardcover book, with Madame’s name on the cover, that same arresting photo he had seen in her foyer. Beneath that photo was one simple word, but it was enough. 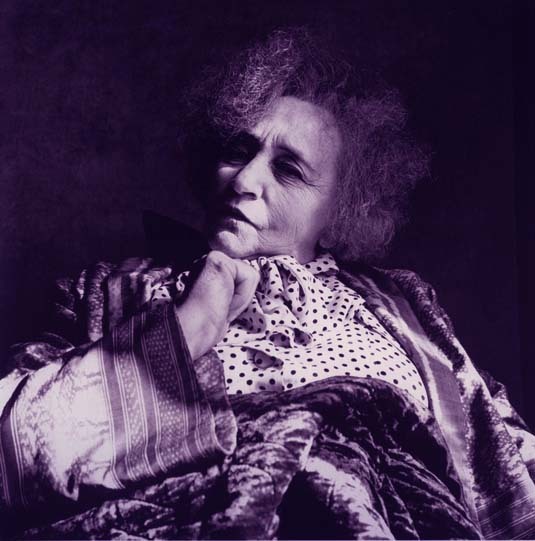 Photo of Gabrielle Sidonie Colette (used for illustrative purposes) by Irving Penn. Posted on June 19, 2011 October 29, 2011 by Tarleisio	This entry was posted in Uncategorized and tagged Amouage, Memoir Woman. Bookmark the permalink. Grand and beautiful. Your muse reminded me so much of Alma Mahler, although she was certainly a lot more conflicted. Memoir is perfectly portrayed in your story. Thank you for another inspiring morning read. Colette is an inspiration, her stories especially about her mother are the essence of how to build a beautiful life from the materials around you. She was so free in the days when women were so unfree, to say the least. Beautiful concept, perfume as a memoir and olfactory symbol of a life well lived. It seems like she touched many people in many ways, in exactly the way they wanted to be. B, I should have known that if anyone would guess at one of my sources of inspiration, it would surely be you! Alma Mahler was indeed floating around the edges somewhere, and no wonder – what a fascinating woman! But the main thing, with Memoir and with all my Amouage stories, was to let the genie out of the bottle and let her have her say. So I did! If I inspired your morning, and on a Monday, no less, then I did what I set out to do, since Memoir inspired me! Lucy, I don't know any writer – at least the female variety – who can't help but be inspired by the magnificent Colette. Everything one could possibly say about womanhood in any aspect, she already said as one of the first, and certainly one of the best! The image, however, was chosen not so much for being a portrait of Colette, but because Irving Penn captured something truly unique – a woman both immeasurably ancient and incredibly young at the same time. Portraits such as these are not so easy to find – just as women who keep that quality with them are…not so easy to find! Colette had it, and so did my entirely fictional 'Madame', who was nothing more and no less than the genie in the bottle that was…Memoir Woman. Another scintillating, perfume-inspired tale from Tarleisio. Brava, woman! I've not had the honor of trying Memoir yet, but as you know, I'm a big fan of the line — and as my perfume appetites are similar to yours, I'll definitely seek this one out. Thank you for a beautiful review. I hope to try this perfume really soon. Tarleisio, you have captured perfectly the essence of Memoir, and why I love it so much—when I wear it, I feel as if I am the Queen of the world: and not in the sense of pomp and circumstance, but actual raw power to influence. It's seductive, and the contrast between darkness and light it at once jarring and spell-binding. Once again, you've cast your spell over me. SOmeone needs to tell Christopher Chong to pay you for these reviews, so that they can publish them on their website, and include a mini-book with each perfume. SInce I bought my Memoir before the mini-book was available, I do hope that he'll send me one, pronto! Dee…thank you. Really. Now, you've made me blush.